Widely known fact... I love dachshunds. There are two snoring at my feet right now in fact, which is a nice reminder that life is good. 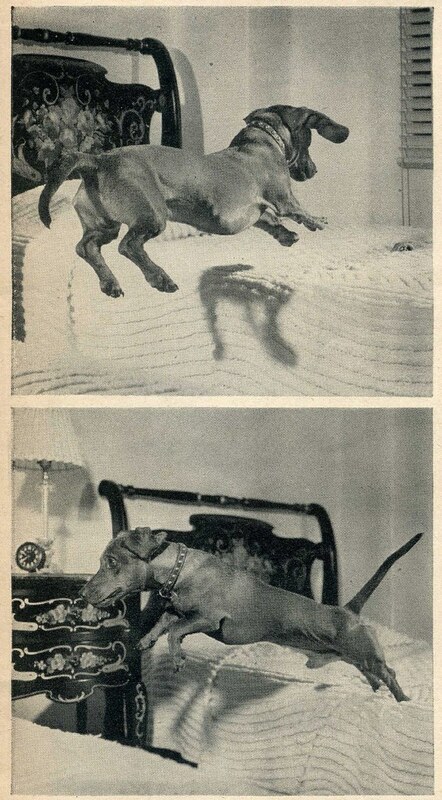 Anyway, I have managed to bookmark a few dachshund themed finds in the last week and rather than slowly torture every one with several posts, I'm going to purge my latest discoveries in one shot. The above image is from a 1945 Life magazine I found in Llano this weekend. If you can believe it this fella was on the cover. His name is/was Rudy (the article points out that he is Mexican) and the story covered his friendship with a cat named Trudy (who is Panamanian). Hard hitting I know. The best part of the article was this line... "Trudy is too lithe and swift for Rudy but she tolerantly allows him, with his preposterous legs and exhaustible energy, to think he is her equal." Ok, maybe it's not GREAT, but I like that dachshund legs are declared preposterous, because it's true. This design is by the folks at Little Friends of Printmaking. This dachshund turned 21 recently and is officially the oldest dog in the world.